Home / Militaria, collectibles, insignia, buttons etc. / M/1922 Sword, Finnish army, NCO model. Issued. M/1922 Sword, Finnish army, NCO model. The sword was designed by Akseli Gallen-Kallela one of the Finnish National Artists, his most known works are the illustrations of Kalevala, but he also designed military awards, uniforms and other national symbols of Finland. This specimen has some marks of wear, and the guard is little bit clanky, some scratches on the blade and some wear on the scabbard. This indicated this sword has been in service use. The sword is manufactured by Carl Eickhorn of Solingen, the stamp is old type, without the name. 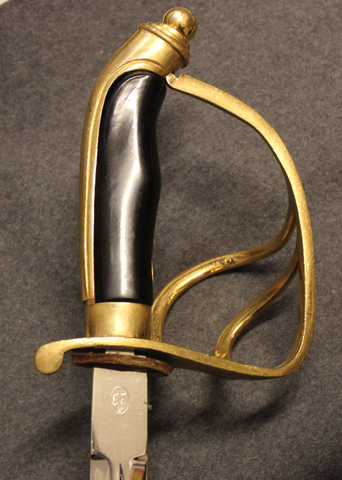 NCO sword was part of uniform of the officers graduated from NCO school, Staff Sergeant - Sergeant major. Without portopé or leather mount for sam browne. Not for persons under 18 years of age.